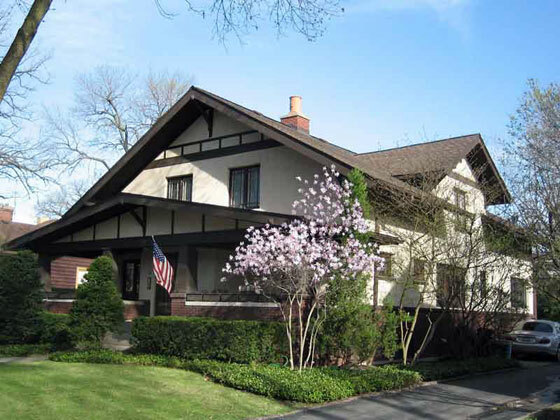 This impressive 1915 craftsman bungalow was originally built as a duplex by Albert L. Salsbury for income property. Each unit had a living room, dining room, three bedrooms, one bath, a fireplace and a kitchen. Frank and Susan Altmayer who purchased the east unit in 1994, and three months later the west unit, united them into a single family home. The exterior underwent only minor changes, while the interior of the house is essentially a new home built in 1994, surrounded by walls built in 1915. The massive, amazing hearth with three openings separating the living room and dining room pays homage to the arts and crafts exterior of the structure, in an otherwise thoroughly contemporary interior design. The meticulous conversion to a single family residence received an Olmsted Society award in 1999.